If you follow the average American diet closely, you will notice that we don’t really get the fair share of vitamins and nutrients that we are suppose to get from a days worth of food. Which explains why we as Americans experience all types of ailments simply because we don’t get enough vitamins in our diet. Especially Women. And with companies practically bombarding people with vitamins and supplements, it can be rather difficult to find the one you need. Even more important, which vitamins are wholesome and not made in a laboratory. Because artificial vitamins are not cool. They don’t help you in the long run and decrease quality of life over time. Also, artificial vitamins can have adverse affects on how your body reacts to food and medicine. Garden of Life Vitamin Code RAW ONE for Women is raw, made with live probiotics and enzymes, gluten free, dairy free, Non-gmo, made with no binders or fillers, no fructose, no maltodextrin, no magnesium stearate, and no corn starch. 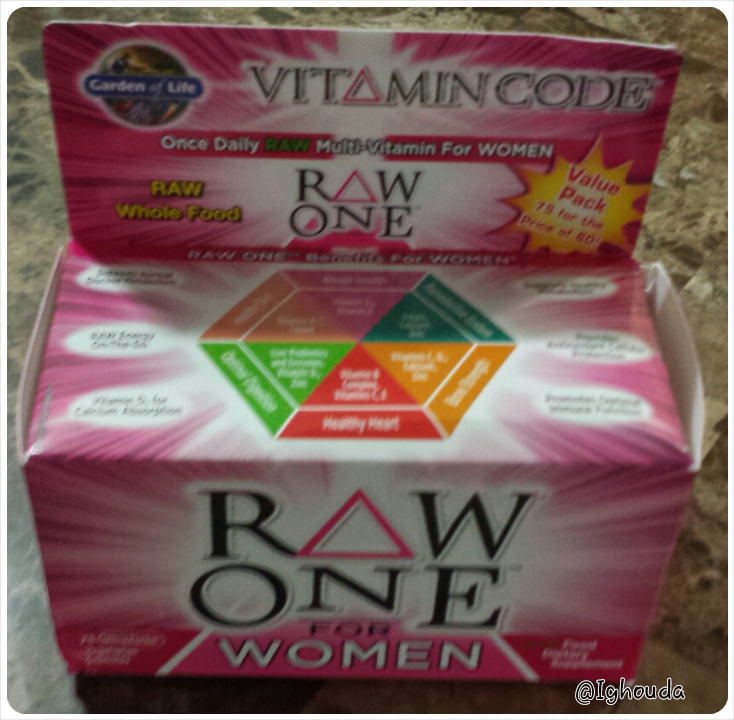 Garden of Life Vitamin Code RAW ONE for Women promotes Breast, Bone, Heart, and skin health. As well as Reproductive System Health and RAW Energy. I have to say that out of all the multivitamins that I have tried over the years, this is the most natural and wholesome multivitamin I have ever used. I also love that I can get all of my nutrients without the binders, fillers and extra chemicals that many multivitamins come with nowadays. Or a ridiculously long list of ingredients that you can read or pronounce. While taking the multivitamin, I noticed a change in my energy. I had more of it, but no jittery feeling and no crashing either. I noticed improvements in my hair and my skin. I didn’t break out as I normally do. I will say however, that in order to notice these results, you must take the multivitamin as instructed. And don’t worry if you don’t like swallowing pills. You can take the contents of the pill out of the capsule and mix it with your favorite juice, water, smoothies, or Garden of life’s RAW Meal, Organic Plant Protein, or Perfect Food. This product was sent to me courtesy of Garden of Life in exchange for an honest review.